Every marketer is required to show that what they’re doing is valuable. Marketing Reporting is the process of measuring progress, showing value, and identifying actionable steps to improve marketing performance and meet your goals. While we all do it, many of us don’t fully understand what we should be reporting on and how to do it effectively — that’s why we created this guide. So if you want to develop systematic and effective marketing reporting practices, then this article has been crafted just for you. Let’s take a moment to outline some benefits as to why we should build reporting into our day to day workflows. Firstly, while it might be completely obvious to us that marketing is worth the investment, there are other people in this world that don’t agree with this assessment. Marketing is an investment in growth but there are some people see marketing as a support function and consider it as a cost. This is where marketing reporting comes in. Marketing reports show the worth of our efforts. If you can show that your campaigns are fulfilling goals, generating sales-ready leads, and bringing in revenue, then you have proven your and your department’s value. More than that, however, marketing reports provide you with a benchmark for how things are working. Where are we succeeding? What needs to be tweaked and improved? Which channels are working and which are not? Where should we focus our efforts and our budgets? All of these questions can be answered with marketing reports and they will guide you on where to focus your time and effort in marketing. 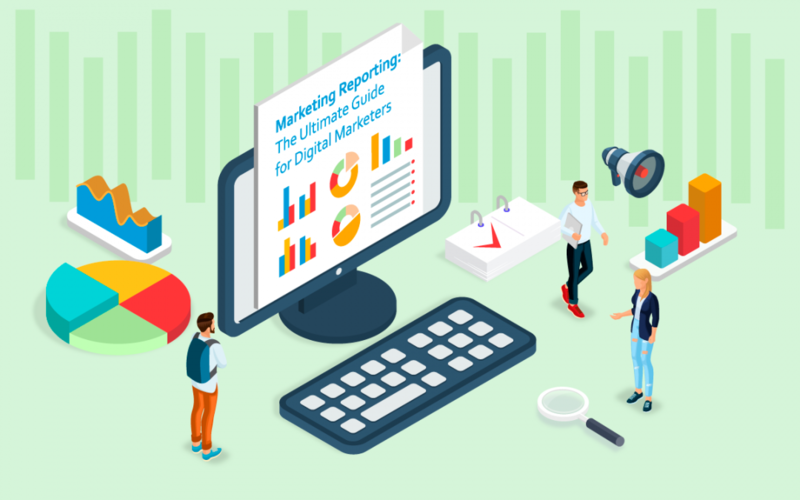 Without marketing reporting, your team is flying blind so it’s vital reports and reporting become a core part of your day to day marketing operations and workflows. While it may seem tempting to report everything, that might not actually be a good idea. Your clients and stakeholders are typically only interested in a handful of metrics – it could be direct website visits and branded search for brand awareness, or conversions and leads for sales. If you report on everything, not only are you failing to highlight what’s most important, you are probably also overwhelming the person reading it. While the types of metrics that you will report will largely be based on your goals, these stats are usually a good starting point. No matter which system you’re using to track data, you will need to build a marketing reporting dashboard. A dashboard allows you to only see the metrics that you believe are valuable to you and your stakeholders. When building a dashboard, you need to really pay attention to your goals and determine if your campaigns are working over time. Plus, you shouldn’t have too many metrics and should focus on a single topic or goal. A quick scan of the dashboard should provide your viewer with everything that is needed. Don’t include too many metrics or make it too complicated to understand. Creating a dashboard typically is pretty straightforward and all of the systems work nearly the same. You have to determine your audience and objectives, and then decide which marketing KPIs you want to include. Let’s take this native Google Analytics dashboard as an example. You can either start with a blank dashboard or use the provided preexisting one and edit it. After that, it’s pretty easy to add, delete or edit segments. To add a segment, simply click +Add Segment, and then select the segments you want. To edit or delete a segment, move your cursor to the top right-hand corner, and click on the X to delete or the pencil to edit. One of the most important considerations when creating a dashboard is determining what charts, graphs or tables to use. You want to make sure that your dashboard is attractive, but still also provide needed information and on what message you want to focus. The goal of all of these should be to make it extremely clear what you’re trying to report and what components provide a great visual representation of the stats. While using a single platform will provide you with all the stats that you need for that particular tool, marketers often need data from different channels or sources for comparison sakes. If you want to do this, then that’s where a product like Supermetrics can be helpful. You can pull a wide variety of data into a single dashboard, allowing you to see how a wide variety of channels are performing and compare the success of different sources. While your metrics may be similar, each channel source report can be slightly different. For example, a SEO report won’t have information on ads and quality score, but a PPC report will. Yet, a SEO report and a content marketing report might be similar in that you’re still looking at organic keywords that are leading to clicks and conversions. A SEO report might even include content information, yet a content marketing report may not include individual keyword rankings and technical issues like missing canonical tags and 404 errors. With PPC performance, you will more than likely do a weekly and a monthly report. Your PPC stats need to be run on a continual basis so you can pivot as needed. Yet, your SEO, content marketing and social engagement reports will most likely only need to be run on a monthly or quarterly basis. Despite the differences, your reports should still show what lessons have been learned, what are your plans for the future and how you plan to address any issues that have arisen. While this is important to consider, you also need to set expectations from the beginning. As just mentioned, you want to be recording metrics for PPC on a weekly basis, but you may not always need to send these to clients. These may be for your internal team and managers. Your peers will probably want to know how campaigns are doing more often than the management team. You should be checking PPC campaigns and perhaps even social engagement metrics on a near daily or weekly basis. If you’re responsible for running the campaigns or you work on a small team, then you should get and share these metrics on a daily basis. If you work on a larger marketing team, then you should share PPC, social, and content marketing metrics on a weekly basis. People higher up in the food chain typically don’t need to see metrics that often – and they probably only need to see major click-through and conversion metrics. In-depth metrics will probably only confuse them and can lead to more questions. Unless your management team is highly involved, a monthly report is sufficient. If you have a board or an active C-Suite, be sure to send them reports on a quarterly basis. The outliers for all of these is SEO. You really don’t see a lot of movement on a weekly – and often – a monthly basis. While you should probably send high-level metrics on a monthly basis, your more in-depth reports should occur on a quarterly basis. These will better reflect true keyword and page optimization performance. Your reports mean nothing if you can’t convert the data into actionable plans. So, how can you use the data in your reports to make your campaigns better? For one, you need to put together a strategy for using your data. Your reports are just numbers if they don’t teach you something. That’s why it’s important to create a model for trying to glean what’s important. One of the most common models to use is the following: reporting → analysis → conclusion → hypothesis → action → reporting. What does this mean? Well, think of it this way: you create your reporting dashboard and review the results. You do analysis of this data, and you start to see patterns, i.e. keywords that are negatively driving up the budget with zero results or call extensions that are doing better than a contact us form. From this data, you create a hypothesis as to why something is working or not working. While you might have a good idea as to why something isn’t working, sometimes you have to test it. For example, perhaps the contact form is hidden on your landing page, or you’re asking too many questions of your visitors. You know people are making it to the page, but they’re not converting. So, you simplify the form or move it up higher on the page. You then run the campaign for a bit longer and get a new report, and then you determine whether or not your hypothesis was correct. If it was, your campaign is optimized and hopefully working better. If not, and your hypothesis was wrong, the cycle starts again, and you need a new hypothesis. The purpose of the report is to take action and see if changing something up will better optimize the campaign. As a reminder, centering your reports around a single topic will help you easily see the historical performance of a campaign and whether it’s reaching important KPIs. When you review your dashboard, determining if, for example, ads are performing above average, average or below average, allowing you to see which ads to leave on or turn off. If you talk to 10 different marketers, you’re bound to get 10 different answers as far as what they’re favorite marketing tools are. For creating reports, most people tend to use spreadsheet based tools like Google Data Studio, Excel, Google Sheets and BI tools like Tableau, Qlik, and PowerBI. The tool that you use will depend largely on your budget and your needs. For most marketers, Google Data Studio is a great alternative to standard paid reporting tools. The major selling point of this one is that it’s free. While there is a learning curve, you can quickly overcome it either by trial and error, or by using one of the many free Google tools. Excel and Google Sheets are two of the most commonly used reporting tools. They require you to manually input the data if you don’t have an automated way of doing it, but you can customize the look of the spreadsheets to fit your needs, and you can even add some visualization with charts and graphs. As far as the paid ones go, most come with a free trial. It is recommended that you do a test run with every one that you’re considering, especially an expensive enterprise tool. You would hate to get knee deep into using it only to find out that it’s too complicated to use, or it doesn’t offer you the data that you really need. Platforms like cumul.io and Smartsheet allow you to create custom reports and they’re relatively easy to use. With these tools you can also create marketing dashboards to easily display information about how your campaigns are performing. Dashboards are continually refreshed to provide you with the most up-to-date information, and they are visually appealing. Pricing is usually by user. For the average agency or marketer, you’re probably looking at about $100 to $200 per month. You should, however, shop around and look at a few different reporting tools. No matter what tool you decide will work best for you, all of them have a natural connection to Supermetrics — a reporting automation tool for PPC, SEO, social and web analytics. It easily lets you import data from all your different channels (like Facebook, Google, Bing, Yahoo, LinkedIn and more) into a single report and expedite the reporting process. With third-party connectors like those offered by Supermetrics, you can pull in additional data from your other accounts, allowing you to create a comprehensive dashboard that showcases all your different campaigns. If you don’t currently have a template that you’re using, then you don’t need to build it from scratch. There are plenty of companies that have done the legwork and have created templates for you to use. In fact, simply do an internet search, and you’re bound to find a few hundred – if not a few thousand. While many of these reports are free, probably none of the ones that you can download for free are going to be automated. Why would you want to automate reports? No matter how careful we are, we’re bound to make a mistake every once in a while when copying and pasting metrics into a single reporting template – or worse – typing in data. The more streamlined your reports are, the easier it is for you to generate a large number of them. Plus, it reduces errors and stops you from the endless hours of reporting. One of the reasons why marketers hate reporting so much is how much time it occupies. In the past, it would take hours – if not days – to get through all your marketing reports for all the different teams that needed to see them. With so many demands on a single person or team, this type of time-consuming activity has to be eliminated. This is what makes automated reporting templates so effective. Just like reporting tools, you have many options for automated marketing templates. 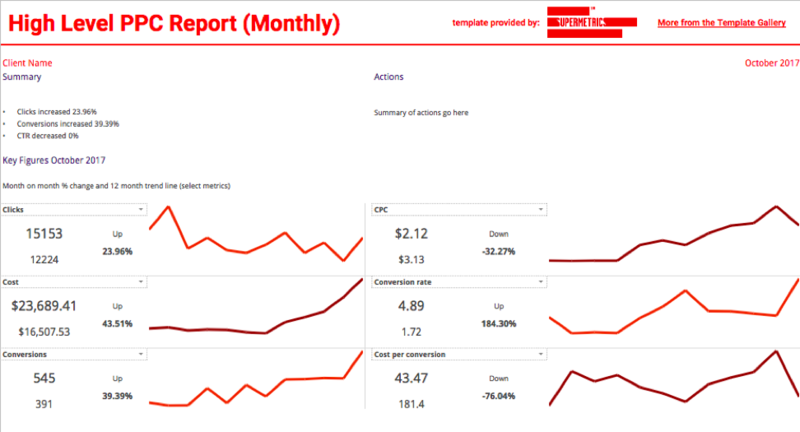 Google Data Studio is an example of an automated reporting template. You can set it up to run data as needed and share it with your major stakeholders. For Google Data Studio, you will have to manually create most of your reporting templates, but once setup, you can run them as needed. 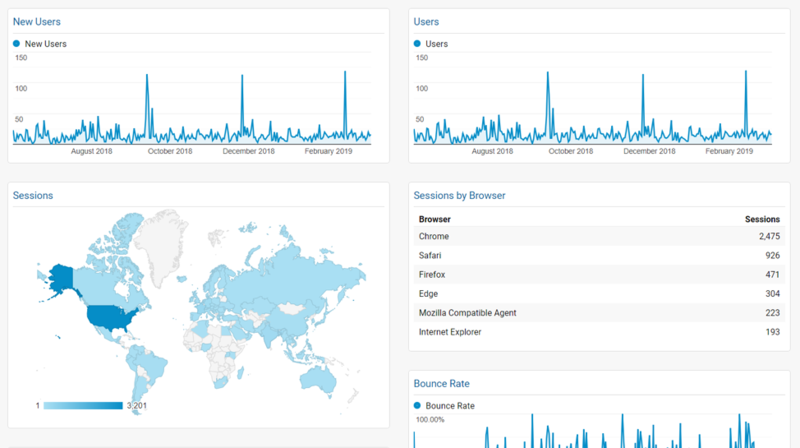 You can also set up dashboards in Google Analytics. These can include high-level stats as well as charts or graphs that can illustrate your data. 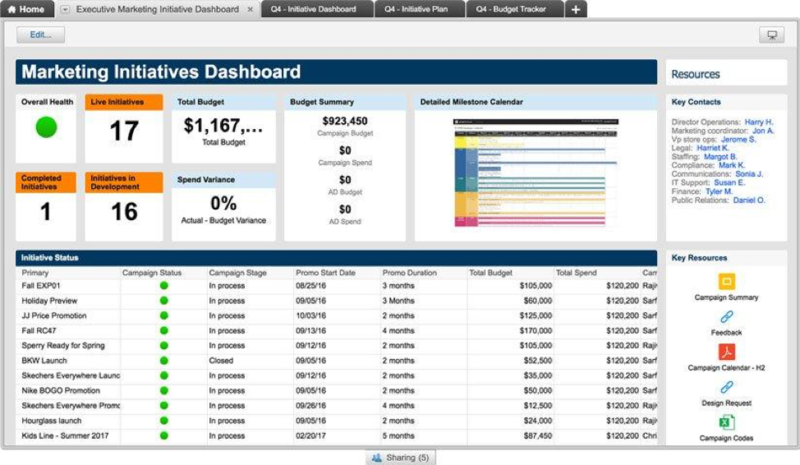 You can allow access to these dashboards to clients, team members or management. You can even create different dashboards for different people. If one of your stakeholders prefers not to log into the tool, it can also be emailed to different people. Google Analytics reports are pretty generic. You’re limited on customization, and you can’t add data from other outlets. With Supermetrics you can also select from a variety of pre-made templates in our template gallery, eliminating the need to create reports from scratch. Not all reports will be the same – in fact, they shouldn’t be. You want to ensure that you’re addressing your audience and providing them with the information that they need to make informed decisions and take the actions that you want. A good report, however, will have similar features. As mentioned previously, you should center your report around a single topic to ensure that you are providing your audience with a consistent, actionable message. You should also select a good chart so your audience can better visualize your data. A reader in a quick glance should be able to tell if you’re meeting industry and internal benchmarks, and determine if your campaign is meeting goals over time, especially important business KPIs. If you’re stuck on where to begin, here are some examples of good dashboards – and what makes them so. Paid Channel Mix Template: With this template, you can quickly see how your paid search efforts are performing across all your PPC channels – Facebook Ads, Twitter Ads, Bing Ads and Google Ads – in a single place. Marketing Initiatives Dashboard: Designed for executive-level members, it provides a quick overview of the health of the campaign as well as a breakdown of overall budgets and what campaigns are running. 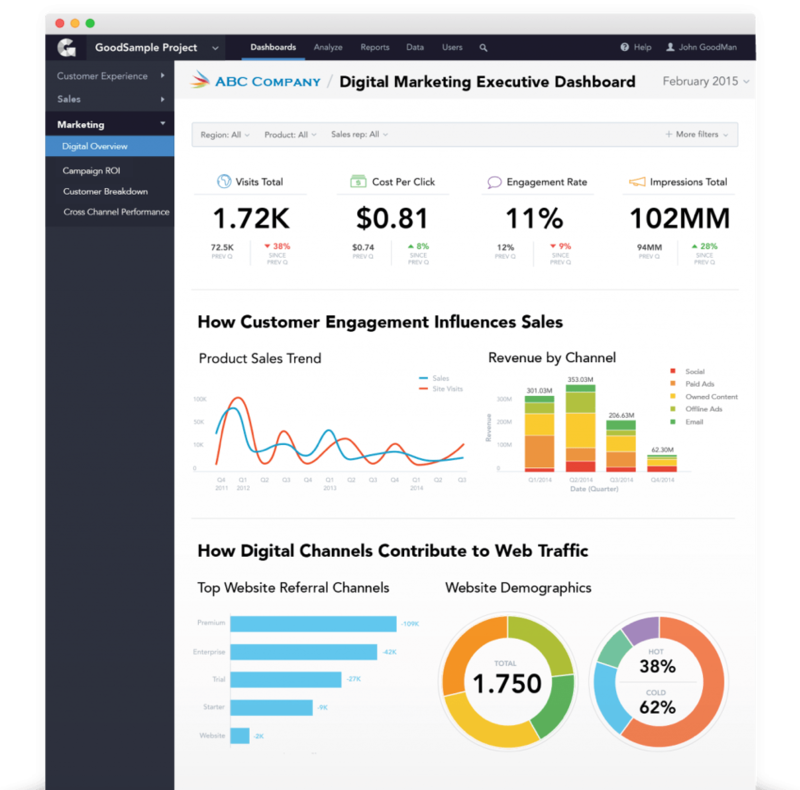 Digital Marketing Executive Dashboard: Another example of a high-level dashboard that provides a lot of digestible information and is visually appealing for management and higher. The goal of these templates are to give you a few ideas, but you might be limited based on the tool that you’re using. Still, your selected marketing tool should provide you with enough flexibility to create customized reports that are visually appealing and useful to your audience. Good reports are designed to quickly provide you with all the data that you need to make decisions and take action. And while they shouldn’t take hours to create, they need to be comprehensive enough to ensure that you can get good, digestible information that you can use to create or tweak your existing strategy. If you don’t already have a template that you’re using, consider using an automated one. If you’d like to easily create more digestible reports for all your stakeholders, then start your Supermetrics free trial today!